Don’t haul the boat out just yet. 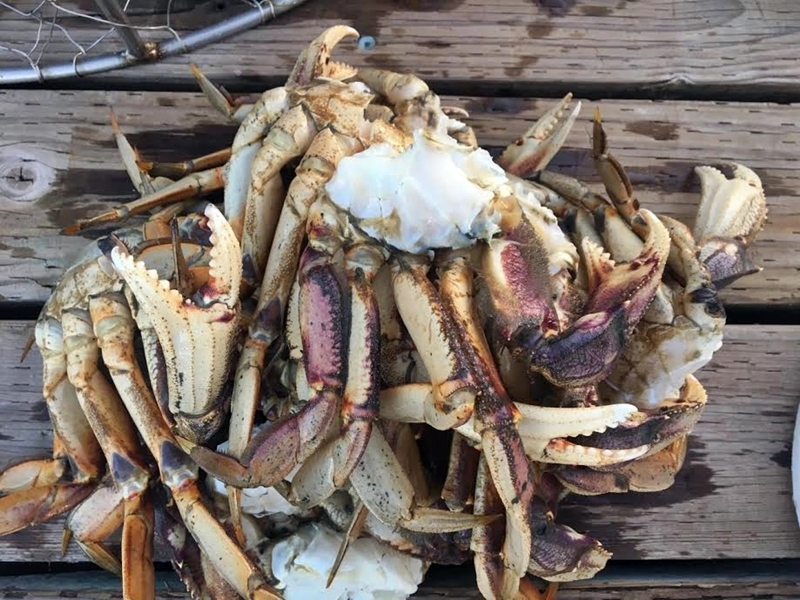 Crabbing is pretty good in the Islands right now. 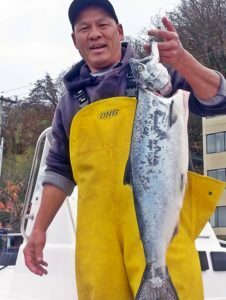 Winter Chinook opens December 1st in Marine Area 7. The limit will be 1 hatchery Chinook daily per person. Tickets are still available for the Friday Harbor Salmon Classic, and Resurrection Derby in Anacortes. The Roche Harbor Salmon Classic is sold out. Crabbing remains open until December 31st. There is a terrific amount of bait in the waters of Area 9, especially at Point No Point, Pilot Point and Double Bluff. Salmon fishing has been good for about one legal salmon per boat. Not many boats are out fishing because of rainy, windy weather. With lots of bait come lots of shakers and seals. Try to avoid (as best you can) hooking undersized salmon (shakers) by fishing with larger baits – for instance 5 inch Pro Troll E Lures and Silver Horde plus in green and glo colors. Remember, WDFW has a very high mortality rate attached to what they term “encounters”. This is not a scientific number, but a number negotiated with the tribes. So, carefully release all shakers. Fish the bottom 10 feet of the water depth and you will avoid shakers. Only one nice blackmouth made the board on Sunday as 25 members endured all sorts of weather. The winning fish came off Duwamish Head right before tide change. Still lots of shaker action all over the Bay and of course some reports of keepers lost at the boat from West Point, the Marina, and Duwamish Head. Members reported marking very little bait everywhere but are still catching a number of squid. Today was all about taking in the beauty the Puget Sound has to offer. The water was glass calm and clear. We watched birds diving at bait that would make its way to the surface. An eagle skimmed the surface in front of us grabbing a juvenile salmon then flying to a tall tree to enjoy its lunch. My buddy and I launched out of Shilshole Marina to follow the bait balls and see if we could find a keeper black mouth. No such luck. Several smaller “shaker” kings were grabbing at our lures. Today I used the Sonic Baitfish by Mack’s Lure. I’ve always loved the versatility of this lure. You can tie it on in three different locations – each giving you a different flutter in the water column. I’ve caught cutthroat trout, kokanee, pike minnow, and even bass on this lure. The tide was now ripping at a good pace. I pedaled back towards the marina and decided to try for a few surf perch. I landed a nice one that I kept dangling on the line with hope of getting some underwater footage with my GoPro. I watched a 30 inch lingcod come up from the bottom and grab my catch before I could turn the camera on. He stuck around watching each fish that I pulled in. It’s days like this that make me appreciate the beautiful area we live in. 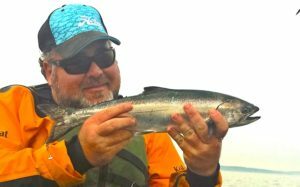 Fishing continues to be good on Lake Sammamish for cutthroat trout. I got a late start on Sunday and ran into a friend who had been out since the crack of dawn. He had landed over 20 fish using a variety of Needlefish spoons with scent. I got out for a couple of hours before the wind picked up marking several fish but only landing one nice cutthroat. I switched between Needlefish and Wiggle Hoochies tipped with a tiny piece of worm. As we move deeper into fall, you’ll start seeing a hatch appearing on the lake. The birds and fish will all be feeding up towards the surface. Look for perch schools to be going deeper. I even picked up a large pumpkin seed while trolling that must have been feeding near the surface in 60 feet of water. That’s a first… tight lines. After Sunday night football the good results may show that this is the start of a good week. The temperatures over here have remained comfortable but mid week we will see finally freezing temperatures. Reports from back up in the dunes Largemouth fishing is good. Just remember that duck hunters are back there also so give them room. With no water going out of Potholes the seep lakes below the dam will start to drop. The duck hunters are seeing increasing mallards in their bag. Also remember that the walleye are here and waiting to be caught especially fishing blade baits over peaks of deep water dunes.